This year will see the Skolkovo Innovation Centre become a true city, Skolkovo Foundation president Viktor Vekselberg told members of the foundation’s board on Thursday, with the first residents due to move in to brand new housing in the summer. 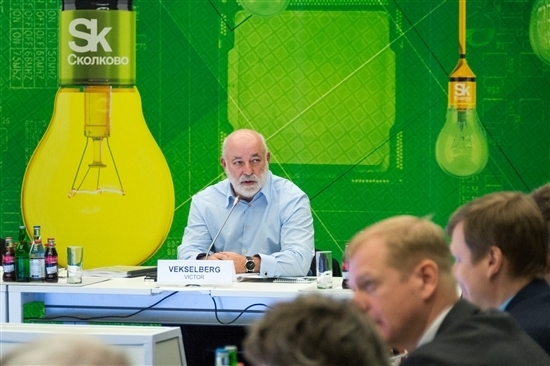 Skolkovo Foundation president Viktor Vekselberg at the board meeting on Thursday. Photo: Sk.ru. Other key milestones this year are set to be the opening of an R&D centre for Boeing – one of the foundation’s key partners – next month, and the opening of the mammoth technopark building to house resident companies by the end of the year. Boeing’s research building was commissioned this week, said Andrei Burenin, chairman of the Skolkovo board. “It’s a really important element to start operating like a city,” Vekselberg told the assembled members of the board, who included retired Intel Corporation CEO Craig Barrett taking part by video link. Vekselberg added that he was optimistic about the international situation and noted that it was a “strong priority” for the government to develop the innovations sector. “Skolkovo has reached a serious level and is ready for new challenges,” he said. The foundation approved grants worth 1.7 billion rubles ($25 million) for resident companies last year, of which 17 percent was made up of micro-grants and mini-grants, said Burenin, summing up the foundation’s results for 2015. The proportion of private co-financing in the grants was 47 percent. Eight organisations joined Skolkovo’s pool of investors last year, including the major Chinese foundation Cybernaut Investment Group. Accredited investors signed 25 deals with Skolkovo companies worth a total of 1.3 billion rubles, said Burenin. Last year, 19 international and Russian partner companies and organisations resolved to open R&D centres at Skolkovo, including German micro-optics and laser producer LIMO, Japan’s industrial robot-maker FANUC, the Russian Olympic Committee and a host of Russian companies including developer Morton. Presenting Skolkovo’s results for its Far East development, Yury Saprykin, head of the foundation’s activities there, said the foundation had attracted 30 residents in the first year of its operations, doubling its target of 15. The Far Eastern branch of the foundation expects 120 million rubles ($1.8 million) in investment this year, and is set to give grants of 100 million rubles, said Saprykin. Several major events are planned to be held in the port city of Vladivostok where the Far East office is based, including the spring school of the Skolkovo Open University and a Patent School in April, as well as an agriculture forum in November.